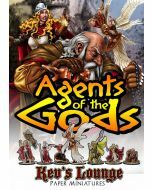 These cutfiles are for the Kev's Lounge Paper Minis set "Agents of the Gods". Cutfiles for Agents of the Gods Paper Minis. These cutfiles are for the Kev's Lounge Paper Minis set "Agents of the Gods". They were created with Silhouette Studio version 3.4.436 by Kevin Richard John Berry.